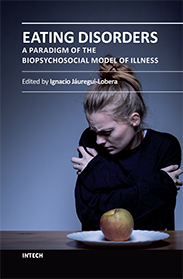 In a special plenary session, researchers involved with a 65 million dollar research project (yet to be published) concluded that the factor most significant in the onset of childhood eating disorders is genetic… not parenting, scientifically negating the widely accepted theory that parents are the cause of their child’s problem, and that parental involvement in their child’s recovery is, by its very nature, intrusive and harmful. In my professional experience over these past three decades in treating individuals and families with eating disorders, I have found knowledgeable parenting to be the “magic bullet” enhancing effective, timely, and lasting recoveries in children. In a workshop entitled “Supporting Your Loved One: Coping and Resources,” I encouraged parents to understand how self-advocacy is a prerequisite to parents becoming effective advocates for the child, the treatment team, the recovery process, and the overall quality of the parent/child relationship. And to be steadfast in seeing to it that their own, and their family’s needs are met. Just as patient activism has become a means for sustaining eating disorder recovery, (preventing relapse), parental activism is what it takes to insure and facilitate the child’s healing. Eating disorders never stand still; they are either getting better or getting worse. Matching the nature and demands of these disorders, parents, like therapists, must seek movement in recovery that is intentional, directed, and tracked. It is this systematic tracking and response to the typically unpredictable and counterintuitive recovery dynamic that yields the most significant learning (healing). With eating disorders, parental love needs to become an action. Parents need no instruction about how to respond when their child has cancer or diabetes; interestingly, they tend to lose their emotional balance, self-confidence, and faith in their instincts when confronting the adolescent life stage, eating disorders, their own personal issues regarding eating, exercise, and weight management, and the search for the best professional team. 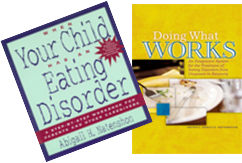 Though the eating disorder shows up in the child, their most effective solutions are found within the family system. The time is now for parents to become apprised of what they have been doing RIGHT… to learn what they already know, and to know what more they need to learn. Parents have forgotten what it takes to do what they do best…to care for their child, purposefully and proactively. They need to be reminded. Recovery from these diseases happens at home, under their parent’s noses and before their eyes…not in the doctor’s offices. Through the process of seeking and finding the best health care professionals, parents also seek and find themselves, as well as the precious child who has been lost to them.